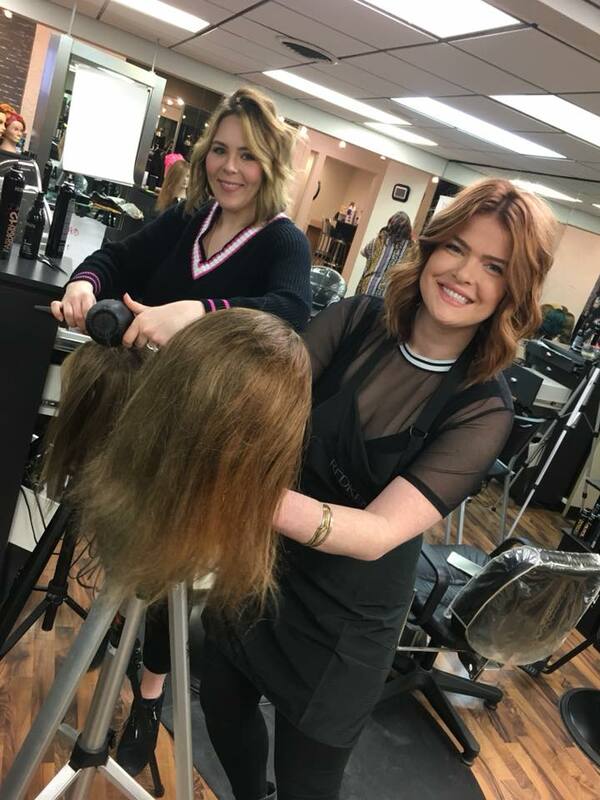 I received a class request incorporating long hairdressing technique and best social media practices for Redken Elite: Hair Loft Salon in Salina, Kansas. I spoke to educational director, Lana Carmona several weeks prior to the class to see what the hairstylists expectations and areas of educational development. I spent a few days coloring mannequins, practicing and creating several looks to showcase. It's all in the set: I needed to practice the looks before I could really feel confident in facilitation the looks to the hairstylists at Hair Loft. I love finishing and I understand practicality of hairstyling for set versus salon. The looks have to be relevant, easily attainable, executed in a timely fashion and ultimately salon appropriate. With the upcoming Spring/Summer season approaching, wedding and prom hair will be in high demand from skilled hairstylists. The looks were created with Basic hairstyling products by Redken. Guts 10 build volume in damp or dry hair. Fashion Works 12 working spray great for control, taming flyaways and creating soft hold that can be reworked. Control Addict 28 Finishing Spray to lock in the look. I arrived a day prior and restyled my mannequins for the following day. I was greeted by the entire staff that had eagerly been anticipating my arrival. I was a bit nervous but this crowd was a fun bunch. We started with foundation work: perfecting a blowout, reworking a shape and building volume. Creating beautifully styled waves was requested by the several of the stylists so we did two styles of curls and brushed them out. After perfecting the curls each hairstylist had the opportunity to photograph the images with a ring light. After each segment we discussed discoveries and what worked. 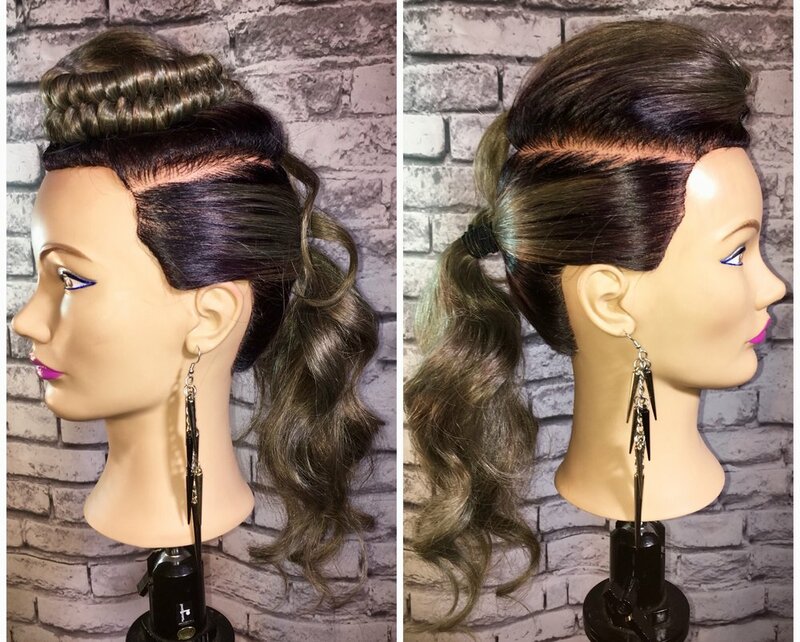 We did several looks that contained fishtails, on scalp fishtails, on scalp french braids, infinity braids and chinese ladder braid. The biggest joys for me our helping the hairstylists tap into their creative side. A few of the hairstylists were hesistant about their braid skills but they were great sports and together with coaching the mastered all the braids. I was blown away by the talent of these hairstylists. The last look involved the usage of hair pads along with kanakalon braiding hair. The usage of these fueled their creativity even more and gave them more tools for completing their prom and bridal hairstyles. Social media education was incorporated by helping the hairstylist generated their own content for their social media platforms/channels. Creating beautiful imagery on their phones with good lighting for posting. Lastly, creating a social media schedule to follow for posting content. The staff made me feel so welcome and I look forward to returning again for our next class. The even made lunch!! The salon was beautiful and the energy was good and these hairstylists truly care about their craft.